In years past the unstable electrical currents have blown up many of my electronic charging devices. Click on the photos above to see in detail the electrical wires going into St. Laurence House. This is the power lines that feed into St. Laurence House. Amazing there hasn't been more fires, power surges, etc. Anyway, I must say the Solio Charger did its job well. I stuck a pencil through the guide and placed the charger in the yard of the hermitage. Our border collie promptly ran over and "marked" this new item in the yard - and this didn't effect it at all. It took about 8 hours to fully charge up but this charge lasted two complete chargings of my phone and I never once had to plug into a wall socket to charge up. 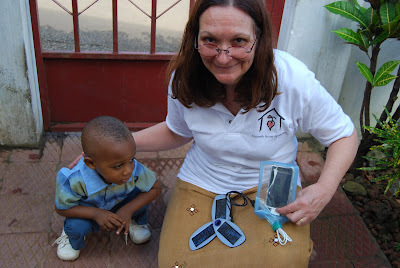 It was kind of fun to be able to generate power in Sierra Leone from stored Louisville Sunshine!!!! 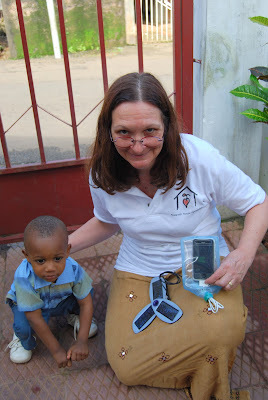 Weather conditions in Sierra Leone are very hard on electronics. The extreme humidity (especially during rainy season) can damage a system in no time. Thanks to Aquapac I kept my phone dry and safe. I didn't even have to take my phone out of the bag to talk, it worked right through the plastic. 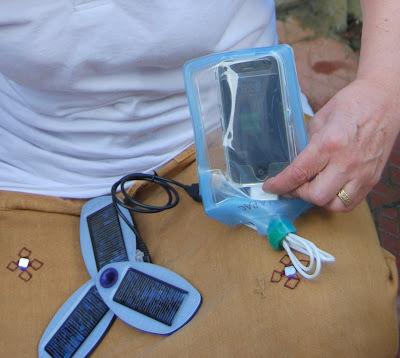 And to my friend, Thank you for the Solar Charger...I recommend it highly, and appreciate your kindness.